The Petroczky family with Emory Eye Center physican Baker Hubbard. When young mother Ashley Petroczky describes the journey she and her family took to arrive at the Emory Eye Center, the telling of it takes a while. For good reason. 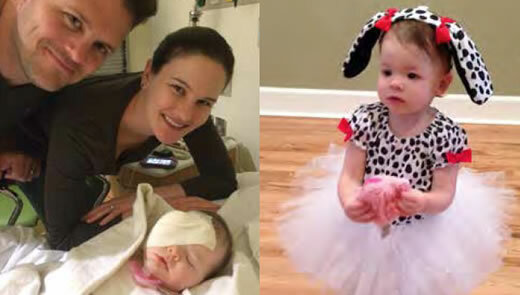 While readying for a family trip to Chicago in Spring 2014, Petroczky, a pediatric nurse by profession, noticed that her baby daughter's eye looked a little strange. But she was a "worrywart," as she says, and didn't think a lot more about it that evening. When she mentioned it to her husband the next day, they decided it was probably nothing, continued packing, and left Tallahassee, Fla., to board a plane to Chicago. Later, in Chicago, under the dim light of an elevator, Petroczky again noticed that same "white" pupil when gazing into her baby daughter Olivia's face. This time her husband saw it too. They instinctively knew something wasn't right. Mom and dad independently Googled what they had seen. Both came up with retinoblastoma or RB, which, as she said, was not what they wanted to find. Petroczky hurriedly called their sister-in-law, an optometrist in Chicago, who suggested taking a photo of Olivia to show the typical red reflex of the eye. Petroczky relates that she was reluctant. But she did take it and sent it to the sister-in-law. Olivia's photo indeed showed the classic white pupil, which can be an indicator of RB. Without even seeing Olivia, the optometrist quickly made an appointment with an ophthalmologist colleague for the next day, a Saturday. That call initiated a flurry of medical visits. The ophthalmologist in Chicago expressed the possibility of RB but did not make a formal diagnosis. He called a colleague, Vikram Setlur, a fellow who specialized in retinal disease and asked him to see Olivia that same day. The family then went to the University of Illinois at Chicago, where Setlur, who was on call, saw Olivia. He thought it could be RB, but an exam under anesthesia was needed to accurately diagnose RB in a baby or young child, he explained. Setlur offered to help arrange care for Olivia in Chicago but noted that Chicago might be inconvenient for the family. He advised the Petroczkys that there was a very good doctor in Atlanta, Baker Hubbard, who treated children with RB. So the decision was made to come to Atlanta, a relatively short four-hour drive from their home. Phone calls were made and a clinic visit was secured. By Wednesday, the family was meeting with Hubbard on his first available clinic day. He let them know that he needed to do his exam under anesthesia, and Monday was the first available time. He also said that an MRI would be needed, as well as consultation with Emory pediatric oncologist Thomas Olson. The MRI was stepped up to that same week, and after the scan on Friday, Olson let the couple know by Saturday that the scan was clear, a wonderful thing. That meant chemo might not be needed, pending more examination. On Monday, following Olivia's exam under anesthesia, Hubbard gently explained to the couple that the tumor had extensively invaded much of Olivia's eye, so removal of the entire eye (enucleation) was necessary. Filled with emotion and ultimately, relief, Petroczky and her husband remember Hubbard's and Olson's patience and thoroughness during their difficult and emotional time. Following the removal, pathology results showed that none of the tumor had invaded the optic nerve and, further, genetic testing showed that it was a noninheritable tumor, very good news for everyone. "Our entire family has been grateful for the thorough, supportive, and kind care we've received at Emory," says Petroczky. "Being young parents, we were naturally very concerned about Olivia's diagnosis, but from start to finish, we had such good help, it made the situation so much better." 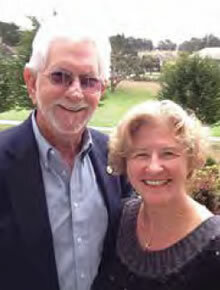 Because of their awareness of the importance of medical research, Petroczky's parents, Bonnie and Steve Anderson, have provided funding for Hubbard's RB research. Petroczky's mother, Bonnie, works in cancer research herself. 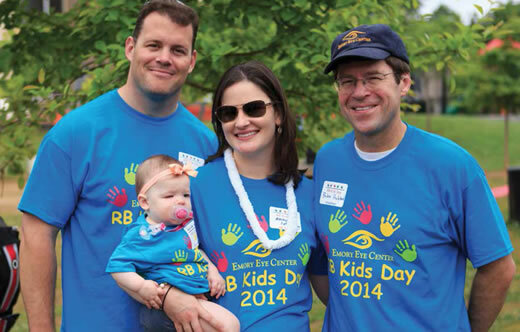 In May 2014 members of the Petroczky family, with little Olivia in arms, journeyed again to Atlanta to be part of the Emory Eye Center's 16th annual RB Kids Day, a celebration of the lives of children who have had RB. Mom Ashley and dad Mike joined other remarkable parents of the center's "RB Kids." Each year, these parents have the chance to meet each other, and the RB kids get to meet and befriend each other as well. This family's journey, which began at home in Tallahassee, traveled north and ended up in Atlanta, was filled with special helpers and medical professionals all along the way. Today Olivia "is a happy, spirited girl," says mom, even though she went through a serious medical issue in her very first year of life. Walking and talking with gusto now, Olivia will no doubt have an inspiring story to tell in her future. And she will serve as an inspiration to other RB families and to the medical team who treated her.